^ 4.0 4.1 4.2 Susan Cobb. Weather radar development highlight of the National Severe Storms Laboratory first 40 years. NOAA Magazine. NOAA. October 29, 2004 [2009-03-07]. （原始内容存档于2013年2月15日）. 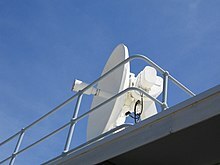 ^ Information about Canadian radar network. The National Radar Program. Environment Canada. 2002 [2006-06-14]. （原始内容存档于2004-06-29）. ^ （英文） Pulse volume. Glossary of Meteorology. American Meteorological Society. 2009 [2009-09-27]. ^ Airbus. Flight Briefing Notes: Adverse Weather Operations Optimum Use of Weather Radar (PDF). SKYbrary: 2. 2007-03-14 [2009-11-19]. ^ Skolnik, Merrill I. 1.2. equation%20radar Radar handbook 请检查|url=值 (帮助) 3. McGraw-Hill. January 22, 2008 [2009-09-27]. ISBN 0071485473. ISSN 9780071485470 请检查|issn=值 (帮助). ^ Skolnik, Merrill I. 19.2. Radar handbook 3. McGraw-Hill. January 22, 2008 [2009-09-27]. ISBN 0071485473. ISSN 9780071485470 请检查|issn=值 (帮助). David Atlas, Radar in Meteorology: Battan Memorial and 40th Anniversary Radar Meteorology Conference, published by American Meteorological Society, Boston, 1990, 806 pages, ISBN 0-933876-86-6, AMS Code RADMET.